Lethbridge College Alert outlines the procedures and tools used to notify the college community during an emergency. Lethbridge College Alert is a comprehensive suite of software, hardware and procedures that comprise our emergency notification system to keep the college community safe and informed during emergencies and unexpected events on campus. In case of an emergency, call 911 immediately. Then call Security at 403-320-3206. Our website serves as the primary hub for information relating to emergencies and unexpected events. During an emergency or unexpected event, a red banner will span the top of the site, directing users to current and time-stamped information regarding the emergency or event. Emails may be sent to campus members, including students, staff and faculty. Due to the nature of email, the website is the resource that will contain the most current emergency information. Emails will direct campus members to the site for more information. 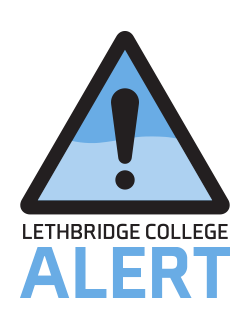 Updates on emergencies or unexpected events will be posted to the official Lethbridge College Twitter and Facebook accounts. If the website or email are unavailable or inaccessible, check our official social media channels for messaging and updates. Informacast is software used as part of Lethbridge College Alert to broadcast emergency messages over IP (landline) phones on campus. Messages are also broadcast as audio and text on emergency clocks located in strategic areas on campus. We will occasionally test Lethbridge College Alert services to ensure proper functionality of the software, hardware and procedures. Campus members will always be notified by email in advance of an upcoming drill. The video is a powerful way to educate viewers on how to respond to an active shooter situation in three memorable steps: get out, hide, fight. It was produced in 2014 by the Campus Alberta Risk and Assessment Committee (CARA) in partnership with Lethbridge College and other post-secondary institutions. Note: Video content is a dramatization that some viewers may find disturbing.